WASHINGTON, D.C. -- Americans remain relatively pessimistic about the U.S. economy, with Gallup's U.S. Economic Confidence Index at -12 for the week ending Oct. 23. This score is essentially the same as its previous reading of -10. Americans' attitudes about the economy have remained relatively stable throughout the year, particularly over the past three months. Last week's score of -12 is equal to the average weekly score for 2016 to date. Of the 42 weekly scores recorded so far in 2016, 28 have been no more than two points above or below the average -- another sign of the metric's general stability. Still, the index has both spiked and tumbled over the course of this year. It climbed as high as -7 in mid-January as President Barack Obama's State of the Union address, in which he defended his economic record, appeared to temporarily boost the nation's economic confidence. Confidence dipped as low as -17 this summer, a score it hit several times throughout June and July. From a long-term perspective, economic confidence has come a long way from the depths it fell to during the Great Recession. Confidence was as low as -65 in October 2008 and continued to remain very negative until late 2012. But while the current level of economic confidence represents a sharp improvement from the index's darkest days, it is notably below a more recent benchmark: the post-recession high of +5 it hit in January 2015. Last week, the current conditions component stood at -4, with 25% saying the economy was "good" or "excellent," and 29% saying it was "poor." The current conditions score is down slightly from 0 one week earlier. The economic outlook component stood at -19 last week, reflecting 38% of Americans saying economic conditions in the country were "getting better," and 57% saying they were "getting worse." The economic outlook component from the week before was -20. 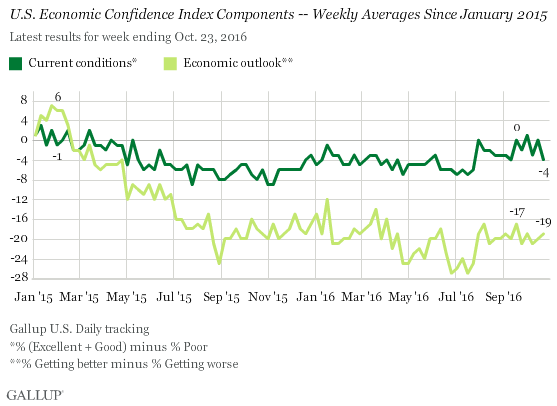 Confidence in the economy has been stable throughout most of 2016, particularly since late July, but attitudes remain generally pessimistic, even if the pessimism is not as widespread as it once was. This is in line with recent Gallup findings that more Americans continue to cite the economy than any other issue as the country's most important problem, but the overall percentage saying this is well below what it was during the 2008 and 2012 presidential elections. Results for this Gallup poll are based on telephone interviews conducted Oct. 17-23, 2016, on the Gallup U.S. Daily survey, with a random sample of 3,540 adults, aged 18 and older, living in all 50 U.S. states and the District of Columbia. For results based on the total sample of national adults, the margin of sampling error is ±2 percentage points at the 95% confidence level. All reported margins of sampling error include computed design effects for weighting. 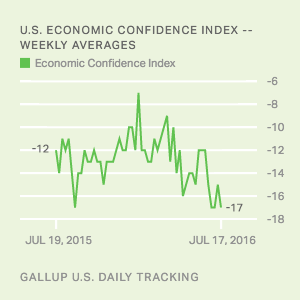 Gallup's U.S. Economic Confidence Index held steady at -10 last week, in line with readings since late July. 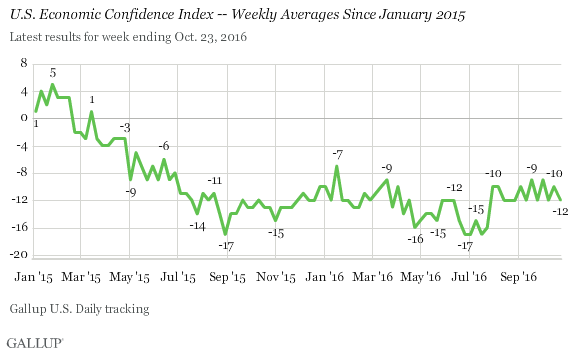 Weekly confidence levels in 2016 to date have varied less than in any year since 2008. But they are less likely to mention an economic issue as the top U.S. problem than they have been in October of any presidential election year since 2000.